If Nobel Peace Prize recipient Mohammad Yunus met Nympha, Girly, Delia and Gigi, he would surely be impressed. That Bangladeshi economist who founded the Grameen Bank some years ago to provide small loans to impoverished women in his country should meet these four enterprising Filipinas who have shops in Mui Wo on Lantau. The four ladies first came to Hong Kong to work as domestics. Today they’re running their own shops, catering not just to their compatriots but also to local Hongkongers and foreign residents. Their stores carry native Philippine foodstuffs and a variety of tinned goods, breakfast cereals, snacks, ice cream, soft drinks and gift items. 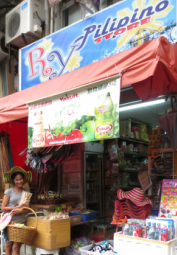 Nympha, who hails from the province of Nueva Ecija in central Luzon, opened her shop in 2007 and called it “RY Pilipino Store” (the initials stand for her daughter’s name, Roxanne Yaneza). Filipinos around Lantau know Nympha’s place as the premier “sari-sari” (Tagalog for miscellany) where one finds not just native foodstuffs but also beauty products, woven mats, hats and brooms. Besides offering cooked food in her shop, Nympha has a monitor that shows Filipino films and a PC available for rental by the hour. With goods stacked higgledy-piggledy almost up to the ceiling, she runs a thriving business not far from the Mui Wo ferry pier. Girly is from Isabela province in northern Luzon and first arrived in Hong Kong 14 years ago to work for a Chinese family. Some years later she met a Pakistani underwriter who became her husband and they now have two boys. Her “Island Store” is located on the ground floor of the Chan Shi Sau Memorial Social Centre by the Mui Wo children’s park. Besides selling Philippine items, she offers Pakistani foodstuffs, fabrics and trinkets. Cardboard “balikbayan” (return to the country) boxes are available in her shop, as in Nympha’s, for use by domestic helpers to send Hong Kong goods to the folks at home. Freight companies based in World Wide House, which offer “door-to-door” service, forward the boxes. The “Eurasia Trading” store, right behind the China Bear restaurant that overlooks the bay, is run by Delia who hails from the resort city of Baguio. She started out selling the usual native products but has lately diversified – she now offers wood carvings, bags and trinkets from her province to attract both local folks and foreign tourists. She came to Hong Kong in 1990 to do domestic work and met her Scottish husband a few years later. The newest entrepreneur is Gigi, whose “Mega Asian Products” is right behind the Mui Wo market. She arrived in Hong Kong in 1995 from Pangasinan province to do domestic work and later married a Briton, now retired. With her children all grown and working at various professions, she decided to set up her shop which sells the same things as those of her three competitors. Her compatriots flock to her place to savour special native dishes like braised banana hearts and stewed fresh hearts of palm. All four women set up their small businesses by investing their savings. But in today’s economic climate, they share the common problem of spiraling rents. Breaking even is a constant struggle, with the threat of arbitrary rent increases hanging over their heads. With no MBAs to their names, the women have learned what it’s like to maintain a small business. Historically, Filipino women were the first to arrive in Hong Kong in the late 1970s to work as domestic helpers, back when the territory was still a British colony. The fact that they know English (the Philippines having once been a US colony) resulted in their becoming the largest expatriate community in the territory. In the late 1990s, Indonesian women began catching up with the Filipinas – their main advantage being a knowledge of Cantonese since their government puts them through intensive language classes before shipping them out. The Jakarta government apparently took a leaf from the Manila authorities’ experience of propping up the Philippine economy through their migrant workers’ remittances. In 2012, Filipino migrant workers remitted close to US$24 billion to the home country. Though economists contend that countries which export their citizens do not provide the ideal solution to the problem of unemployment at home, the migrating waves continue. Indeed, until better conditions prevail in their home country, the Filipinas who venture abroad will continue to bear the burden of helping their families survive. But a few of them may be as lucky as Nympha, Girly, Delia and Gigi who have graduated from domestic work to become their own bosses.